Congratulations on making a phenomenal decision to invest in the UltraCut Method! Can you already feel the fat burning welling up inside of you? This is such a powerful system and the best part is you will start seeing results within the first week! Because you have chosen to take action today, you have a one-time opportunity to upgrade your order to include a my original UltraCut Workouts. This is 12-full weeks of some of the best workouts you will ever do. I lay out these workouts step-by-step, so all you need to do is follow along and do them. With as good as the bodyweight bonus workouts are that I have included, even better results will come when you combine the UltraCut Method and these workouts! UNLOCK YOUR ULTRACUT ACCESS NOW! ($47 Value) – Phase one of the Ultra Cut program will challenge you from day one. The workouts were designed to put you on the fast track to getting ultra cut. Each workout builds upon the last ensuring that you are getting stronger each time you hit the gym. No matter what fitness level, the workouts in Phase One can be done by beginners or advanced workers. You will get the jumpstart you need to ensure you are prepared to take on the rest of the Ultra Cut program! ($47 Value) -Phase two of the Ultra Cut program will consist of a continued mixture of strength and circuit training workouts, that will slowly help you transition into phase three. You will find more challenging workouts in phase two to ensure you continue burning unwanted fat while replacing it with lean muscle. ($47 Value) – Phase three of the Ultra Cut program will be focused on gaining strength, and lots of it. Each workout during phase three will be focused on getting stronger. Phase three will help you to understand that the more lean muscle you have, the less fat you will have. This phase will also incorporate some earth shattering finisher workouts, so be warned! ($47 Value) – The final phase of the Ultra Cut program has some of the most challenging workouts that you will ever see. This is the true mixture of strength training and circuit training all mixed into each workout session. 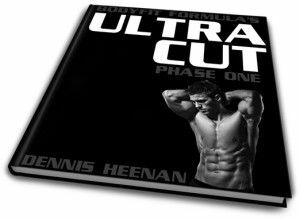 After going through the previous three phases, your body will be prepared to take on the final phase of the Ultra Cut program. This final phase was designed to obliterate unwanted fat while maintaining all the lean muscle you worked so hard to put on. This phase alone will be worth every penny spent! Yes! Add the UltraCut Workouts Pack to my order at over 70% OFF, just $27.77! No thanks. I understand that this is my only opportunity to get access to this information and I’m okay with missing out, even at today’s HUGE discount. I understand that after declining this offer, the UltraCut Workouts will never be made available to me again at this price, even if I wish to pay more. I will pass on this forever.